The gaming industry continues to grow rapidly, and it is projected to grow another 30% in the next three years1 . Online gaming is driving this growth as the industry is making a seismic shift from disk to digital. This shift comes with an abundance of opportunities and challenges, as digital gaming makes it easier than ever to get games into the hands of more players, in more places, in less time. 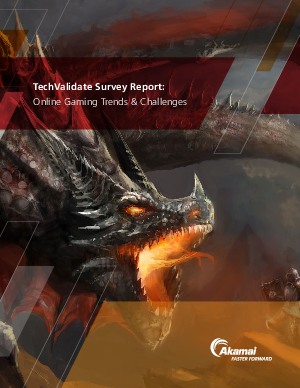 TechValidate Research surveyed 131 Akamai Technologies, Inc. customer accounts to find out more about how gaming companies are innovating the marketplace and the challenges they need to overcome in order to do so. The results show the importance of web security, that acquiring and retaining new users is the biggest business challenge companies are facing, and that mobile is taking over as the most popular gaming platform.